Carlton sent me a few rackets to be review a while ago. I finally gotten round to stringing up the Powerblade 9909 and did some long term testing and review. The design of the racket is not traditional Carlton. in fact, quite the opposite. it is – long racket – slight Isometric head – long carbon handle About the only thing that bears the Carlton tradition is the relatively flat taper at the end of the handle. However, what is unique about the PB9909 is the shaft. the shaft bears the special label “shaft by Mitsubishi Rayon, Japan”. Mitsubishi Rayon is more famously known for their golf shafts. and it will be interesting to see how golf technology will affect the play of this racket. 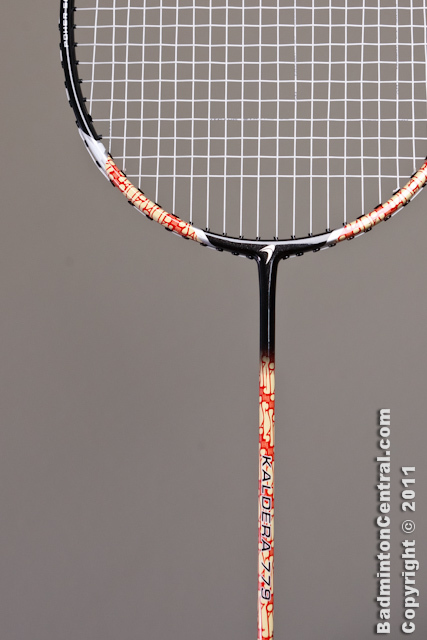 The racket is “Ti-wire reinforced” throughout the shaft and head, as well as utilizing Nano-resin for the graphite composite. The design is quite pleasing, a blue dominant color scheme with silver and gray highlights. utilizing sharper color transition and gold accents gives a good departure from smooth Yonexians design. kudos to Carlton for striving to be original and separates itself from the el-cheapo amateur Chinese graphics design as well as not joining other manufacturers in cloning popular Yonex graphics and naming. the result is a fresh looking and unique racket that is actually quite attractive. 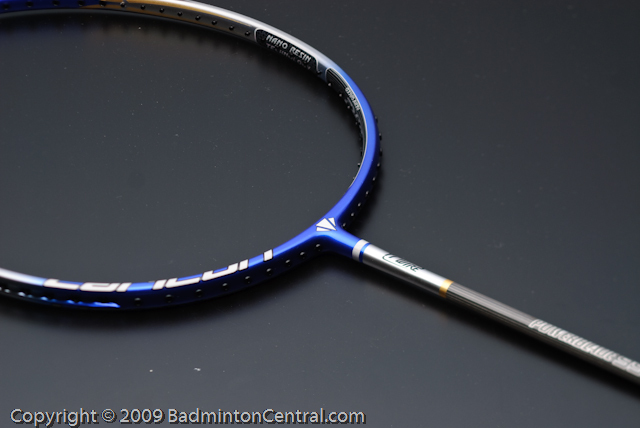 The PB9909 is a 4U racket with an advertised weight of 78g. max tension of 28lbs. balance point at 300-305mm. I had it strung up with Carlton AG66 string (gotta match it up with Carlton strings! ), one piece stringing @ 25lbs. I spent a full 4 hours testing out this racket in the gym. After a few minutes of warming up, the racket and new strings has started to break in and loses the initial vibration feel. and i myself starting to accustom to its character. I was surprised at the solid feel of the PB9909 despite the 78g weight. in fact, it feels like a 2U racket. 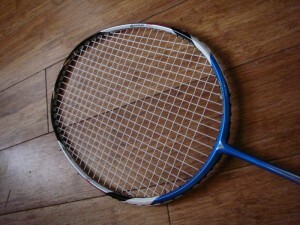 the racket is very stable, the racket head held its direction even with off center impact with the shuttlecocks. The shaft is stiff, lively, it will reward anyone with lots of power in their technique. it does means that it probably won’t suit anyone without a solid foundation with their hitting skills. look to the lower end models which we will review in the future. however, if you have that power in you, the Carlton PB9909 is a joy to use. in fact, the harder you hit, the more rewarding it is. when impacting the sweetspot at power, it gives out a very deep “bam” sound, but when hit at even higher power, BOOM, and explode into the shuttle. initially, i didn’t have any extra overgrip on hand and had to make do with the factory grip. surprisingly, it was quite adequate in terms of grip. however, i also noticed that the underlayer of the factory grip was too soft and was allowing some sliding movements which i do not like. later on in the testing period i have replaced the grip. the liveliness of the shaft really shines when it comes to defense. remarkably, i compared it with many other rackets i have, this racket gave the most effortless defense, a small flick will drive the shuttle back deep and far. now, the bad. touch and feel of the racket is only mediocore. i personally prefer rackets that don’t damp out most of the vibration and the vibration is a feedback. the PB9909 unfortunately damps out a little bit too much of the feedback. as a result, i have more trouble with it doing delicate pushes and netshots. the feedback feels a bit hollow. eventually one gets used to it. overall, i think Carlton has come up with a excellent racket that is suitable for strong intermediate to advanced player.